The same craft skill used to produce hurdles can be used to create one continuous fence line over any distance where the fence post are integral to the fence. 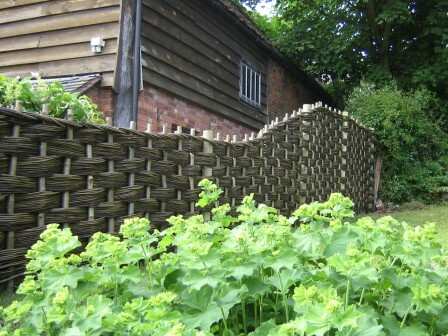 Normally using hazel or willow, continuous fencing provides a neat finish which provides opportunity for curves and shape to be incorporated into the height and fence line. Steep slopes and fluctuations in the ground can be easily accommodated with this style of fencing.